To examine the effects of Pi on leaf angle, Ruan et al. (2018) look at leaf angle in rice (Oryza sativa). Leaf angle depends on the tissues that attach the leaf to the stem; in rice, the lamina joint links the blade of the leaf to the leaf sheath. The elongation of cells in the lamina joint modulates leaf angle—the longer the cells, the farther the leaf blade can angle away from the vertical leaf sheath. 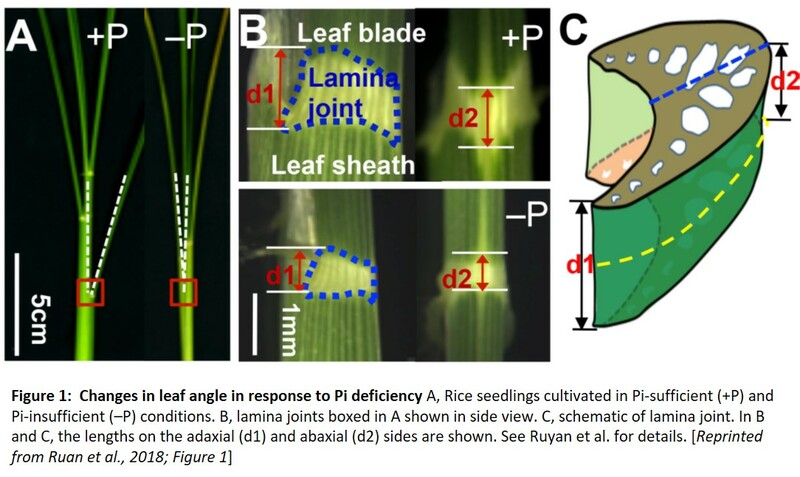 Indeed, the authors found that in plants grown under Pi deficiency, the cells on the abaxial and adaxial sides of the lamina joint are short, making the joint and the leaf angle smaller (see figure). 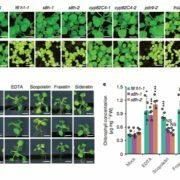 To decipher the mechanism affecting this response, the authors examined Pi signaling-related transcription factors, finding that mutants affecting PHOSPHATE STARVATION RESPONSE 2 (PHR2) did not alter the response of leaf angle to Pi, but mutants affecting the SPX (Syg1/Pho81/XPR1) domain proteins SPX1 and SPX2 did. 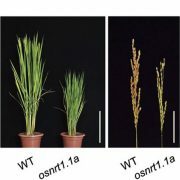 The spx1 and spx2 mutants had a wider leaf angle and longer lamina joint cells than wild-type rice and the overexpressors had smaller cells, narrower leaf angles, and thus more-erect leaves. SPX proteins generally interact with and inhibit transcription factors. Therefore, the authors next used yeast two-hybrid assays to identify proteins interacting with SPX1. 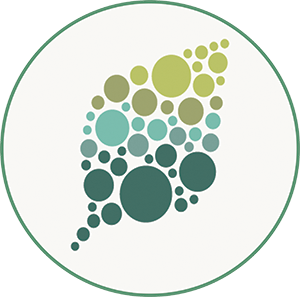 They found the transcription factor REGULATOR OF LEAF INCLINATION 1 (RLI1), which shows some similarity to PHR family genes, but lacks the coiled-coil domains. They confirmed the SPX1–RLI1 interaction by co-immunoprecipitation and bimolecular fluorescence complementation. Mutant and overexpression studies supported the hypothesis that SPX1 and SPX2 negatively regulate RLI1. First, the rli1 mutants showed an erect-leaf phenotype and the RLI1 overexpressors showed increased leaf inclination, opposite to SPX1 and SPX2. Examination of the lamina joint cells showed consistent effects on cell elongation, with shorter cells in the rli1 mutants and longer cells in the RLI1 overexpressors. Finally, overexpression of SPX1 in the RLI1-overexpressing plants partially suppressed their phenotype and the presence of the rli1-1 mutation suppressed the spx1 spx2 phenotype in the rli1-1 spx1 spx2 triple mutant. 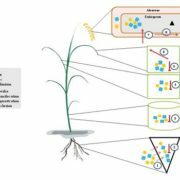 Given that RLI1 encodes a predicted transcription factor, the authors asked what genes it might regulate. Based on the similarity between RLI1 and PHR2, they found that RLI1 could bind the PHR2 cis-element; mutagenesis of this element identified variants preferred by RLI, with the consensus NNAKATNC. Examination of rice genes related to lamina joint development identified this sequence in the promoters of the genes encoding the transcription factors BRASSINOSTEROID UPREGULATED1 (BU1), and BUL1 COMPLEX 1 (BC1), which increase leaf angle by promoting elongation of cells in the lamina joint. Measurement of BU1 and BC1 transcript levels in RLI1 overexpressors and rli1 mutants, along with chromatin immunoprecipitation, showed that RLI1 activates BU1 and BC1 by directly binding to the cis-element in their promoters. Consistent with the genetic interactions, overexpression of SPX1 reduced binding of RLI1 to the BU1 and BC1 promoters. In Pi-sufficient conditions, the authors found strong expression of RLI1 in the lamina joint. Pi-insufficient conditions induced expression of SPX1 and SPX2 but repressed RLI1, BU1, and BC1. In the authors’ model, low Pi induces SPX1 and SPX2, which inhibit RLI1 function, thus decreasing expression of BU1 and BC1, inhibiting cell elongation in the lamina joint and decreasing leaf angle. How does this neat regulatory module figure into Pi responses? 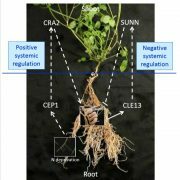 Given the intensive requirement for Pi in photosynthesis, the authors hypothesize that the erect-leaf phenotype may decrease incoming light, reducing photosynthesis and thus allowing plants to conserve Pi. 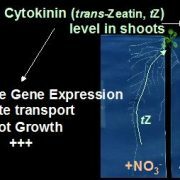 Moreover, the authors identify differences between the erect-leaves phenotypes induced by Pi deficiency and lack of brassinosteroids; they speculate that the effects of brassinosteroids target another Pi-intensive process, cell division, rather than affecting photosynthesis. 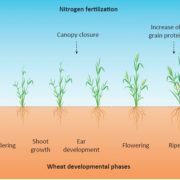 Determination of the exact details may allow application of these finding to decrease crop sensitivity to low-Pi conditions. Ruan, W., Guo, M. Xu, L., Wang, X., Zhao, H., Wang, J., Yi, K. (2018). 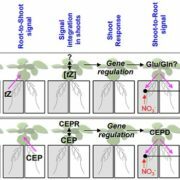 An SPX-RLI1 Module Regulates Leaf Inclination in Response to Phosphate Availability in Rice. 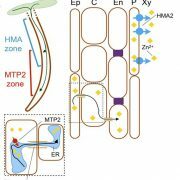 Plant Cell DOI: https://doi.org/10.1105/tpc.17.00738.